The five houses at Gråbrødretorv 1-9 were built after the great fire of Copenhagen in 1728. It was the first major disaster in the city's history. At that time, fire insurance for houses didn't exist. So the fire was a catastrophe for Copenhagen. But it's an ill wind that blows no good, and the fire led to the establishment of Copenhagen Fire Insurance. 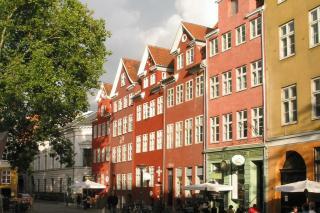 The five houses on Gråbrødretorv are built to a design called fire houses". The buildings are built as "gable attic houses". The sloping roof runs parallel with the narrow facade of the houses facing the square, but each house has a large gable attic in the centre of the eaves. " In 1772, a Norwegian poet named Johan Herman Wessel was living at Gråbrødretorv 3 when he wrote a tragedy entitled Love without Socks. Wessel was a modest man but his friends made sure the play was performed at the comedy house on Kongens Nytorv named Den danske Skueplads. Wessel shot to stardom overnight. The Norwegian students took the opportunity to join forces and found a literary club called The Norwegian Society. Wessel earned too little from his poems to constitute a proper living. When he died in 1785 the poet left only debts, and verses full of humour and wisdom. The inscription on his grave reads: He ate and drank, was never happy / He wore down his boot heels crooked. / He couldn't be bothered to do anything / In the end, he couldn't be bothered to live." "